Peaceful Reader: Jennifer L. Holm did my homework! Well, not really but she made it easy. When asked, as part of my UNI Children's Literature class this summer, to pick an author out of a list of many interesting authors I picked her. Even though she's been on my radar I haven't read anything of hers and it was time. Jennifer had what sounds like an idyllic childhood. Her father was a pediatric doctor and her mother was a nurse. She had four sporty brothers and she did her best to keep up with them. She read voraciously even, as one neighbor noted, she raked the yard. It seems that she easily carried her passions into her desire to write. Each of her young female characters are gutsy and refuse to be pigeon-holed into the idea of women in their time period. This is a quick read filled with fun adventures.Getting to know her brothers, neighbors and relatives was part of the joy of this story. May Amelia is a character I will remember. This book was transformed into a play by the Seattle Children's Theatre-would love to have seen it. 2. 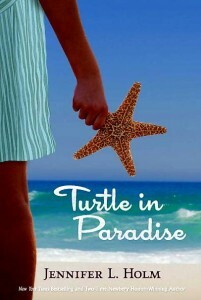 Turtle In Paradise (2010) Life isn't like the movies, and eleven-year-old Turtle is no Shirley Temple. She's smart and tough and seen enough of the world not to expect a Hollywood ending. After all, it's 1935, and jobs and money and sometimes even dreams are scarce. So when Turtle's mama gets a job housekeeping for a lady who doesn't like kids, Turtle says goodbye without a tear and heads off to Key West, Florida, to stay with relatives she's never met. While Turtle is another very high-spirited character compared to May Amelia she is very different and world-wise. I loved the beach setting and the very unique Key West culture and language. Her boy cousins and their baby business was hysterical! See this is how you know an author is multi-talented...dropping into a whole new genre and doing it well! This is part realistic fiction, part journal and a great peek at middle school. Ginny is brave and bold and can clearly state that her dad died and she's looking for a new one. 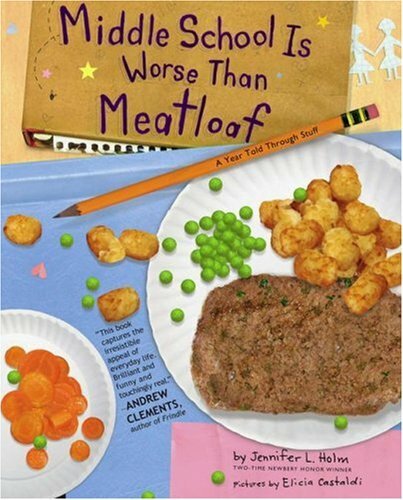 This book is filled with fun notes between Ginny and her mom, movie receipts, drug store necessities, homework assignments and all this great middle grade angst. 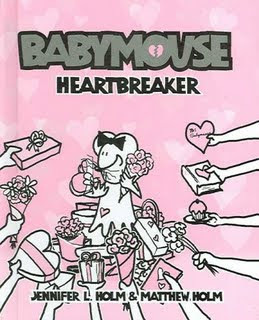 Babymouse (2005 and beyond) This is a pink comic book (not just for girls though) about a funny little girl mouse who's in elementary school. I'd like to read the whole set but haven't yet; the one I read (Heartbreaker) is about going to the Valentine's Day dance. Babymouse can't find anyone to take her even though her best friend is available. I have Groovy Girl hooked on these now. This series, to me, defined Jennifer L. Holm as an above average creative force; the mouse put me over the moon! Jennifer lives in Northern California with her husband and two children, Millie and Will. She loved Lloyd Alexander's Prydain series and now I have this on my radar to read. Babymouse has her own website-must introduce my students to this!